Specializing in the development and production of natural microbial products for the treatment of environmental issues associated with the various uses of water. Microbe Lift products are the most sought after product for water quality, clarity and overall fish and pond maintenance. 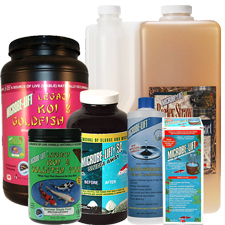 Here you'll find a wide variety of products such as bacteria, fish food, barley, and fish treatments. Natural, beneficial, environmentally safe bacteria used to improve water quality and clarity. Breaks down fish waste and uneaten fish food, metabolizes dead algae, and improves dissolved oxygen levels. Available in liquid and dry forms. Nutrient rich foods with high digestibility rates. With low phosphorous content, this food keeps fish waste to minimum and helps to ensure superior water quality. Chemical algae treatment formulated to control green water and string algae. Maintain a healthy, balanced water garden with this full line of pond treatments. Natural biological and chemical treatments, dyes, salt, and mosquito control are all available. Keep your goldfish and koi happy and healthy with a full line of bacterial and parasitic treatments. An environmentally responsible pond conditioner that is a clean and easy, natural and organic approach to a healthy pond environment. Available in both liquid and dry forms. Plants are an essential component in all ponds. Not only creating beauty but, also helping to maintain an overall balanced ecosystem. We offer a complete line of products you'll need to grow and maintain healthy aquatic plants. If you're looking for test kits or media bags, you'll find them here. Balancing the pond with Microbe Lift products is safe for wildlife and pets and promotes fish growth and health. A natural, beneficial, environmentally safe bacteria that is non-pathogenic, non-toxic and non-caustic. Microbe-lift PL creates a healthy environment in your pond and promotes faster fish growth. It improves dissolved oxygen levels and reduces hydrogen sulfide odors. Microbe-lift PL works in both high and low alkalinity. It metabolizes dead algae and dissolves away organic sludge. 10 - 20 2 oz. 1 oz. 1 oz. 21-50 4 oz. 1.5 oz. 1.5 oz. 51-80 6 oz. 1.5 oz. 1.5 oz. 81-250 8 oz. 2 oz. 2 oz. 251-500 10 oz. 3 oz. 3 oz. 501-1,000 14 oz. 5 oz. 5 oz. 1,001-1,500 18 oz 6 oz. 6 oz. 1,501-2,500 24 oz 8 oz. 8 oz. 2,501-3,500 28 oz. 10 oz. 10 oz. 3,501-5,000 32 oz. 12 oz. 12 oz. 7,501-10,000 48 oz. 20 oz. 20 oz. Formulated for the removal of organic bottom solids that are slow to degrade, especially helpful in ponds that have a rock or gravel bottom or where vacuuming is impractical. As organic solids accumulate on the pond bottom, they begin to break down releasing toxic gasses. These gaseous by-products can endanger fish, marine life and plants. Microbe-Lift Sludge Away reduces and eliminates potential harmful gaseous compounds and helps clarify your pond water at the same time. 80-2,500 2 oz per 100 gal. 1 oz per 100 gal. 2,501 - 5,000 1.75 oz per 100 gal 1 oz per 100 gal. 5,001 + 1.5 oz per 100 gal 1 oz per 100 gal. Compare to AlgaeFix, same active ingredient and 20% more concentrated. For use in self-contained ornamental ponds and fountains without any outflow. For small ponds with heavy algae growth, clean the excess algae off the sides and ornaments before adding ALGAWAY 5.4 . This will reduce the amount of decaying organic matter. Fountains, Small Ponds with goldfish and koi - Treat only those fountains and ponds which will have no outflow after treatment. High water temperatures cause more rapid natural decay of dead algae which can cause fish distress. If animals are present clean out excess algae as stated above or use before temperature exceeds 75°F (24°C). CAUTIONS: In ponds, insure that water is well aerated via waterfall, fountain or other method to prevent fish loss. Aeration must be continuous. Not safe for use with snails, shrimp and other crustaceans or mollusks. Repeat dosage once per week. Aqua Xtreme is a convenient liquid, single-phase, full-function water conditioner that has been scientifically formulated for use in koi and goldfish ponds. Product should be used when: conditioning new water for ponds; adding (or prior to adding) water, new fish or plants to ponds; and transporting koi or goldfish. It is very important to use Aqua Xtreme when adding water to a pond that contains chloramines. Conventional dechlorinators will detoxify the chlorine in the chloramines but do nothing to the ammonia released from the chloramines. Aqua Xtreme will detoxify both the chlorine and the ammonia in chloramines. Microbe-Lift Nite Out II is designed specifically for pond waters that contain marine life. Its highly-specialized microbial consortium of nitrifying cultures are specially formulated to eliminate ammonia via a natural biological process termed nitrification. The cultures contained in Microbe-Lift Nite Out II will establish, promote or stabilize and maintain nitrification in pond waters, eliminating the toxic effect of ammonia. Microbe-Lift Nite Out II liquid nitrifying bacteria contains select strains of Nitrosomonas, Nitrospira and Nitrobacter. Nitrosomonas convert ammonia to nitrite and Nitrobacter and Nitrospira convert nitrite to nitrate. Microbe-Lift Nite Out II comprises select microorganisms that are autotrophic-able to use carbon dioxide as the sole source of carbon-and are relatively slow growing, requiring specific conditions for optimum growth with typical cell division rates from 8 to 16 hours. Their performance and rate of growth are impacted by the environmental parameters required for nitrification. They are also highly oxygen-sensitive, requiring high dissolved oxygen levels (greater than 2 mg/L) to achieve maximum growth rates. Nitrite is produced by beneficial bacteria in the pond and the oxidation of harmful waste ammonia excreted by fish. Even though nitrite is not as toxic as ammonia, it is still very damaging to the health of fish. 80-500 1 oz. .5 oz. 1 oz. 500-2500 5 oz. 2.5 oz. 5 oz. 2500-5000 10 oz. 5 oz. 10 oz. Formulated with Malachite Green & Formalin. Use for disease caused by Ichthyophithirius (Ich), Chilodonella, Costia, Oodinium, Trichodina and fungal infections. Microbe-Lift BSDT is the preeminent broad spectrum malachite green and formalin treatment. The only malachite green and formalin treatment that can be used in water temperatures as low as 50°F, thus allowing treatment in early Spring and late Fall. Malachite green and formalin are two drugs that are more effective and less toxic in combination than when used individually. This is the definition of synergism. What makes Microbe-Lift BSDT the preeminent product in this field is the fact that it is formulated with malachite green chloride, instead of the more toxic oxalate salt. As with any malachite green and formalin treatment, do NOT use with other medications. Prior to initial use, at least a 25% water change should be made. A nearly total water change (>90%) will greatly improve effectiveness. Carbon Filtration must be removed and UV's turned off during treatment. Treat once a day for three consecutive days. A proprietary formulation (polymeric blend) used to coagulate suspended solids in the pond water. After use, particles in the water settle to the bottom of the pond and/or filter out through the filter system. After the milky-haze period, conditions should clear within 12 to 24 hours. Dosage may be repeated if necessary.